If John R. Butchell’s wagon hadn’t become stuck in the mud in his search for a site to build his university back in 1870, then the Wagon Wheel trophy would never have been born. He eventually settled on a site where Akron is now located. But, he had to leave a wagon wheel behind as it became buried in the mud. When digging for a pipeline in 1902, the wheel was discovered and landed in the hands of the president of Kent State University. In 1945, it was decided that the wagon wheel be used as the trophy given to the winner of this annual contest. 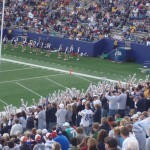 On this day, the Zips and the Golden Flashes would duel straight into double overtime. 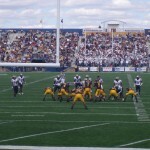 Kent State appeared to have the momentum for most of the game and had the opportunity to send the game into a third overtime with a chip shot field goal. 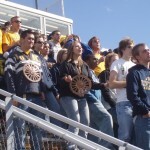 Unfortunately for the Flashes, the attempt sailed left and Akron players almost instantly hoisted the beloved Wagon Wheel. 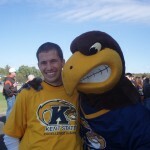 Celebrating with their fans, Kent State was left to feel dejected. 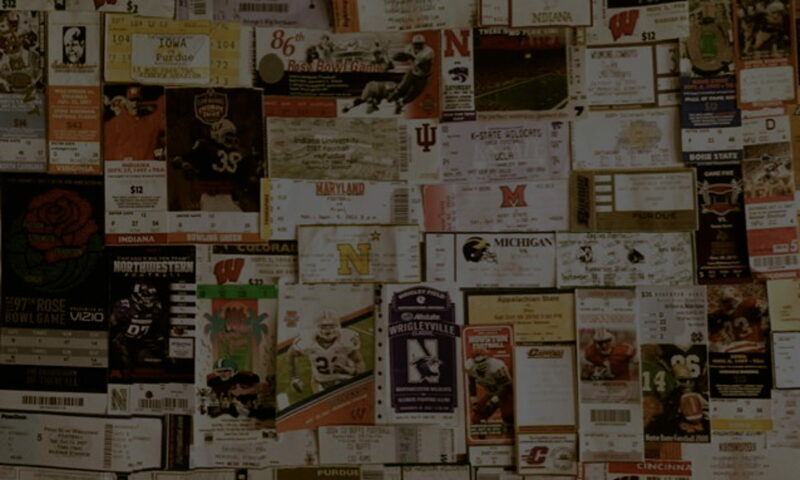 But, once again, it proves that these trophy rivalries contain important meaning for teams regardless of their national acclaim. The Zips kept in it all afternoon. 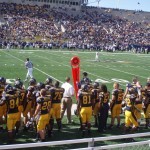 Kent State players look on. 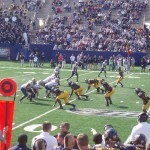 Akron driving on Kent State.